Full Brain Swaps and Partial Brain Swaps: Would Either Prove the “Brain Storage of Memories” Dogma? We have all been brain brainwashed. We have been brainwashed into believing various unproven dogmas about the brain, including the idea that all our memories are stored in our brains. Scientists have not proven such dogmas. But they constantly assert such dogmas, so often that the average person is as unlikely to question them as the average person in North Korea is unlikely to question the constantly repeated assertion that his dictator is a brilliant genius. Consider the dogma that all our memories are stored in our brains. When you recall something, your body does nothing to suggest that you are using your brain to retrieve the memory. If I retrieve an apple on my table, my body gives me two different signals that my arm is being used to retrieve the apple. The first is the sight of my hand grasping the apple, and the second is the feeling of the apple in my hand. But if I retrieve a memory of my childhood, my body does absolutely nothing to hint to me that my brain is being used to perform this retrieval. The memory could be stored locally in my soul, or in some mysterious external consciousness infrastructure unknown to us. Even when we scan brains with medical devices such as MRI machines, when a person recalls something there is no convincing evidence that information is being loaded from a brain location. See here for a discussion of how such brains scans have been hyped enormously, with their meager results being exaggerated very much. A typical MRI scan of someone retrieving a memory will show something like a 1% variation from region to region in the brain, something that tells us basically nothing. We can imagine an experiment that might prove that memories are stored in brains. Some animal might be trained to learn some information. The animal's brain might then be dissected, and scientists might somehow attempt to retrieve information supposedly stored in the brain. If the scientists could retrieve very specific information that was unknown to them – such as an image that the animal had been fear-conditioned with – that might be proof that a memory was stored in a brain. No such experiment has ever been done. Scientists have done some fancy memory experiments with mice using a technique called optogenetics. 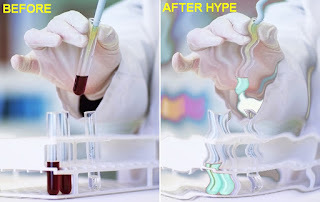 Although such experiments have been greatly hyped in the popular press, a close examination of them will show they do not live up to their hype, as discussed here. Such experiments do not prove that specific brain cells of mice store particular memories, and certainly do not prove that any human memories are stored in the brain. One might claim that death is an experiment proving that our memories are stored in our brains, on the grounds that memories all die when the brain dies. But when a simple TV set stops working, that doesn't prove that the TV shows it displayed were stored in the TV. They were actually stored externally. Moreover, near-death experiences mean that we cannot conclusively claim that cessation of a person's brain activity means the end of his memories. Is there any experiment with humans that might prove that memories are stored in brains? I can imagine a bizarre future experiment that might attempt to do such a thing. It would be an attempt to perform a brain swap. Let us imagine some scientists who wanted to test whether swapping the brains of two humans might result in a complete transposition of their personalities and memories. The idea would be to swap the brains of two people, and see whether the body of the the first person was then occupied by someone claiming to be the second person, and the body of the second person occupied by someone claiming to be the first person. January 25, 2045: Scientists completed their controversial brain swap experiment, and things went exactly as predicted. The brain of the terminal cancer patient John Baker was swapped with the brain of the terminal cancer patient Eddy Hawkins. 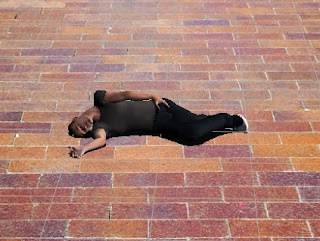 After the operation, the person with the body of John Baker claimed to be Eddy Hawkins, and the person with the body of Eddy Hawkins claimed to be John Baker. No doubt if such a result were achieved, scientists would say it was decisive proof that memories are stored in brains. But it actually wouldn't be. Let's suppose that John Baker's memories are stored not in his brain but in a soul. Let's suppose that the memories of Eddy Hawkins are stored not in his brain but in his soul. Now suppose we swap the brains of John Baker and Eddy Hawkins. Until death a person's soul may be kind of anchored not to his whole body but only to his brain. So if we swap the brains of the two men, we may cause their souls to move into different bodies. Now after the brain swap, it might be that both the soul of Eddy Hawkins and his brain is now in the body of John Baker, and it might be that both the soul of John Baker and his brain is now in the body of Eddy Hawkins. Doing such a brain swap doesn't allow us to tell whether the memories of these men are stored in their brains or stored in their souls. But let us imagine a different type of experiment – not a full brain swap but only a partial brain swap. It might be done on two terminal patients. First a complete inventory of both of their skills and memories might be made, by having them answer a long series of questions and fill out various standardized subject tests. Then a small part of their brains could be swapped. A small part of the first patient's brain might be replaced with a corresponding part from the second patient's brain, and that same part of the second patient's brain might be replaced with a similar part that had been removed from the first patient's brain. Then scientists might look for sudden losses or sudden additions in the memories of the two patients. What might conceivably happen is something like this. After this partial brain swap, the first patient might still claim to be the same person he had always been. But he might claim that his memory had been changed. He might now be able to remember things he never knew before. There are all kinds of weird possibilities. It might be that John Baker might remember his experiences between ages 5 and 20, and also remember his experiences between ages 30 and 60. But his memories of life between ages 20 and 30 might be the memories of Eddy Hawkins. Or it might be that John would no longer remember how to play the piano, but would now remember how to fix cars – knowledge that he had gained from Eddy Hawkins. Eddy, on the other hand, might no longer know how to fix cars, but might now know how to play the piano, something he had never previously known. It would seem to be impossible to reconcile any results such as these with any theory that memories are stored in the soul. Given such results, you would finally have proof that memories are stored in the brain. It is quite possible that such an experiment might be performed. But I doubt very much that it would produce results like those just described. As discussed here, scientists do not have any workable theory of how the brain could be storing memories that last for 50 years. The main theory of memory is that memories are stored in synapses. 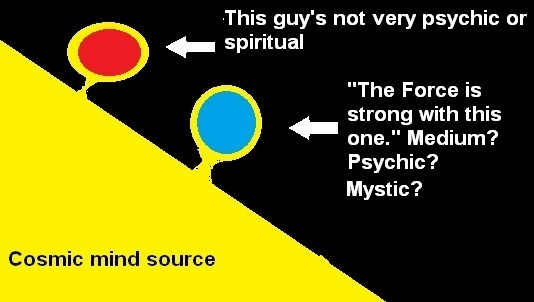 But there is a huge reason for doubting such a theory. Synapses are subject to rapid molecular turnover and structural turnover which make them unsuitable for storing memories lasting longer than a year. If this partial brain swap experiment is ever done, I think it will not produce results showing a swapping of memories. I think we will one day be able to swap brain tissues between two people, but I think such an experiment will not actually result in a transfer of memories. There are experiments such as these that could in theory verify the idea that our memories are stored in brains, but such experiments haven't been done. The claim that all our memories are stored in our brains is a dogmatic assertion not yet proven by either observations or experiments. Near-death experiences, Lorber's cases of people with good memory but fractional brains, and the lack of a workable detailed theory of brain memory storage all suggest that such a dogma is not correct. 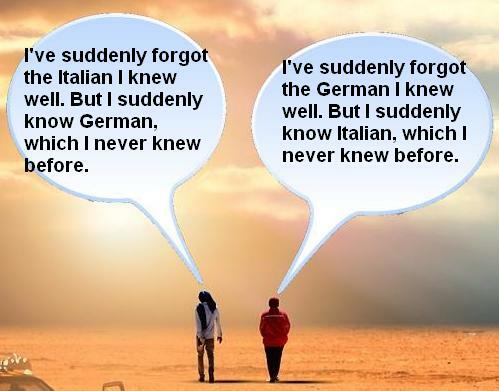 Another thing casting doubt on such a dogma is the very fact that we are able to instantaneously recall obscure facts and distant memories. Scientists have no explanation as to how a brain can do such a thing, which creates all kinds of "how could a brain know where to find the exact location where a memory was stored" explanatory problems discussed here. When this area [the temporal lobe] was stimulated, 40 out of about 1000 patients reported vivid flashbacks -- a fragment of a tune, a child calling, being in a room. All were marked by a dreamlike quality with no sense of time or location. He believed that this was evidence that our memories are stored in one place in a complete and recoverable form. Later researchers pointed out, however, that few of the patients recalled actual memories. A page online says Penfield "did not provide support for the claim that what was elicited was actually a memory and not a hallucination, fantasy or confabulation." Philosopher Daniel C. Dennett has long been regarded as one of the top apologists of materialism, so no doubt his fans must have had high hopes for his new tome, entitled From Bacteria to Bach and Back: The Evolution of Minds. But the book fails to give us anything like a coherent plausible explanation for the origin of human mentality. The first part of the book consists largely of Dennett pontificating about natural selection, which Dennett inaccurately portrays as some great creative force. What we have are the typical exaggerations and misstatements of Darwin fanboys on this topic, and they are delivered most dogmatically, with very little supporting evidence. Dennett provides no examples of innovative complex macroscopic features of organisms that have been proven to have originated by natural selection and random mutations – because no such proof has been produced by scientists. 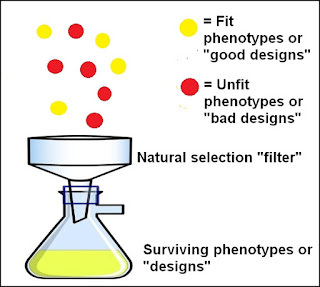 Contrary to Dennett's assertions, natural selection is merely a kind of pruning effect or filter that gets rid of bad designs, not something that has any power to produce complex good designs. Natural selection may describe survival of the fittest, but does not explain the arrival of the fittest. The diagram above tells the true nature of natural selection. 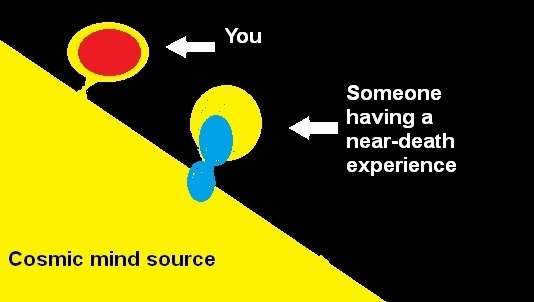 It is not something that explains the appearance of the yellow circles in the diagram, but merely explains how the red circles got filtered out. On page 43, Dennett claims that natural selection is a collection of algorithms, and on page 384 he claims that “natural selection is a substrate-neutral family of algorithms.” These claims are false. An algorithm is a sequential set of steps to follow to achieve a particular result, being something that is processed by either a mind or a computer. Natural selection is simply the observational fact of survival of the fittest, the fact that fit things survive longer and reproduce more than unfit things. Natural selection is neither an algorithm nor a collection of algorithms. The great question about natural selection is: how could this mere pruning effect (which is merely a filter) ever explain the astonishingly complex and coordinated biological complexity we see in the real world? Dennett doesn't explain this in any substantive way, although he very clumsily provides a visual to try to warm us up to the idea that something apparently designed can be produced naturally. He gives us a Science magazine photo showing some circles of stones, and discusses a geological theory that supposedly naturally explains these circles as natural geological effects. The problem with that, of course, is that the complexity we see in biological systems is trillions of times more complex (and gigantically more coordinated) than some little circles of stones. Later on Dennett has a chapter with the rather silly title “Brains Made of Brains.” On page 155 he advances the frequently stated misconception that the brain is massively parallel. Getting things all mixed up, he states, “Brains are parallel (they execute many millions of 'computations' simultaneously, spread over the whole fabric of the brain); computers are serial (they execute one single simple command after another, a serial single-file stream of computations that makes up for its narrowness by its blinding speed).” To the contrary, human brains do not do many computations simultaneously, and humans can do only one math computation at a time; conversely you can buy desktop computers that actually do dual-processing which is parallel processing. Sounding like a real Richard Dawkins fanboy, Dennett goes on to a long enthusiastic discussion of Dawkins' idea of memes. But such a discussion is not something that helps at the job of explaining the appearance of human minds. Memes are ideas, and do nothing to explain how we have a mind that produces ideas. Dennett seems to dodge or largely ignore the main difficulties of explaining the origin of minds such as ours. One of the principal difficulties is the fact that according to the prevailing account, in a period of a few million years hominid ancestors evolved into large-brained humans; but the population of these hominids was supposedly very small when this happened, being no greater than 20,000 or so. The problem is that such a progression would have required many beneficial mutations, and the number of mutations in a population is proportional to the size of the population; so beneficial random mutations in a small population should be incredibly rare. As discussed in this scientific paper, calculations based on known mutation rates suggest that a few million years is way, way too small a time to allow for so many favorable mutations in such a small population, which we should not have expected to see in even 500 million years of time. This “waiting time” problem is one of the chief difficulties of explaining the origin of human minds. But Dennett simply ignores it. Another set of difficulties lies in the fact that our minds have quite a few characteristics that we cannot plausibly explain by appealing to natural selection. As was pointed out at length in this essay by the co-founder of the theory of natural selection (Alfred Russel Wallace), the human mind has many capabilities and abilities that seem to be impossible to explain by means of natural selection, because they are things that do not improve an organism's chance of surviving in the wild. Among these things are aesthetic abilities, insight, curiosity, philosophical abilities, language abilities, mathematical abilities, spirituality, and altruism. As argued here, none of these things would make an organism significantly more likely to survive in the wild, so we cannot explain them by the idea of natural selection. So how did we get them? Dennett fails to provide an answer. In my essay I referred to in the previous paragraph, I didn't even mention an additional problem: the difficulty of explaining man's very long-term memory. Humans have memories that can reliably recall things that happened 50 years ago, but this is very much a “luxury feature” exceeding by a factor of 25 what is necessary for survival. An organism would do just fine in the wild remembering things for only one or two years, by just remembering all of the skills and body/location memories it used in the last year or two. Besides being inexplicable from a Darwinian standpoint, our minds capable of storing memories for 50 years are inexplicable from a neurological standpoint. The leading theory of memory involves the idea that synapses store memories. But that doesn't work, because (as discussed here) synapses are subject to very rapid molecular turnover and structural turnover which should make them unsuitable for storing memories for longer than a year. As far as I can see Dennett completely ignores the whole issue of explaining human memory, not even trying to explain it. He also seems to dodge or largely ignore the main philosophical issue involved in explaining human minds – the issue of how it could possibly be that a merely physical thing could produce the rich mental reality of our consciousness. Philosophers have long smelled an inherent implausibility that any merely physical thing (no matter how complicated its arrangement) could yield the very non-physical thing we call the human mind. For a physical brain to produce Mind seems rather like a stone pouring out blood when you squeeze it. The only way Dennett seems to handle this issue is through a gigantic cop-out. His fourteenth chapter is entitled, “Consciousness as an Evolved User-Illusion.” I won't describe his nonsensical reasoning, but will merely note that the moment a thinker starts claiming that consciousness is an illusion, he has revealed the intellectual bankruptcy and unreasonableness of his assumptions. Of course, by claiming that consciousness is just an illusion, a writer has a convenient excuse for failing to explain it, on kind of the grounds of “there's pretty much nothing there to explain.” It's convenient Dennett has such an excuse, as his book sheds little light upon the origin of our minds. Postscript: Today I am reading Evolution and Ecology: The Pace of Life by Cambridge University biology professor K. D. Bennett. Referring to speciation (the origin of species), this mainstream authority says on page 175, "Natural selection has been shown to have occurred (for example, among populations of Darwin's finches), but there is no evidence that it accumulates over longer periods of time to produce speciation in the Darwinian sense." So why have we been so often told the opposite by Darwin enthusiasts? The Origin of Life Was a Zillion Times Harder Than "Dividing Droplets"
There's a silly article recently added on the Quanta online science site. The article is entitled “Dividing Droplets Could Explain Life's Origin.” Apparently some scientists have discovered that some lifeless particles can naturally divide, and some of them are talking as if this fact may help us explain the origin of life. But it has been common knowledge for thousands of years that round lifeless particles can naturally divide. This has been known to anyone who ever closely looked at the rain drops on the side of a tree during a rainy day, and who noticed that big drops often divide into smaller drops while they are dripping down the bark. Why is it very silly to be claiming that dividing lifeless particles do anything to help explain the origin of life? It's because cells are more like miniature cities than like raindrops. So when a cell divides, it isn't like a raindrop splitting into two. When a cell divides, it's more like a city magically making a copy of itself, like you might have if Miami were to make a copy of itself which started floating on the Atlantic ocean. 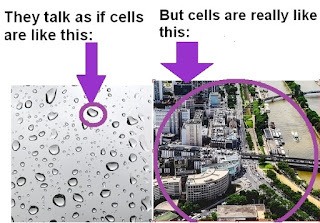 The claim that cells are like cities is made at this science education site, where we are told that a cell's membrane is like a city wall, that a cytoskeleton is like a city's transport system, that the cytosol is similar to a city's streets, that the lysosomes are like a city's recycling plant, that the mitochondria are like a city's power plants, that the nucleus is like a city's library, that the ribosomes are like a city's factories, and that the endoplasmic reticulum is like a city's industrial park. One does nothing to explain the origin of such incredibly complex functionality by talking about a division of tiny natural particles or droplets that are not complex, and don't have anything like intricate functionality. But it may be argued that the cells we observe in our microscopes are more complicated than the first living cells. That's true, but even the first living cells must have been incredibly complicated, far too complicated to have arisen by any known natural process. A team of 9 scientists wrote a scientific paper entitled, “Essential genes of a minimal bacterium.” It analyzed a type of bacteria (Mycoplasma genitalium) that has “the smallest genome of any organism that can be grown in pure culture.” According to wikipedia's article, this bacteria has 525 genes consisting of 580,070 base pairs. The paper concluded that 382 of this bacteria's protein-coding genes (72 percent) are essential. So multiplying that 580,070 by 72 percent, we get a figure of about 418,000 base pairs in the genome that are essential functionality. What is the chance of such functionality falling into place accidentally? Essentially zero. Analysis of what is known as the fitness landscape of proteins indicates that proteins are highly sensitive to changes, with minor changes disrupting their performance. They “can be exquisitely sensitive to changes in the amino acid sequence,” as a biology text notes. 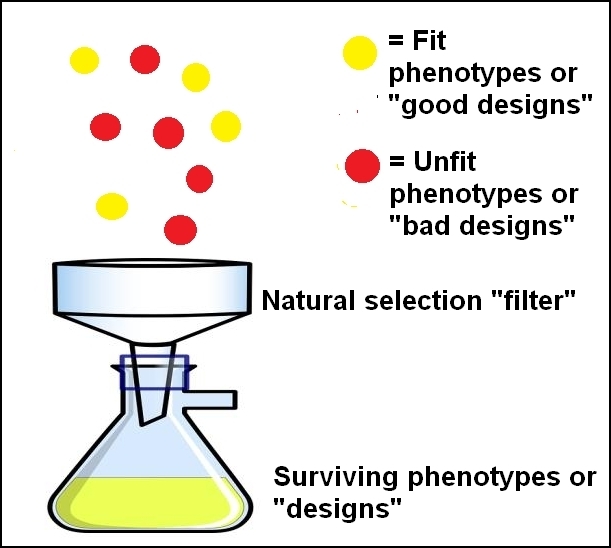 For example, an analysis of the fitness landscape of a protein used in fluorescence found that “3/4 of the derivatives with a single mutation showing reduced fluorescence and half of the derivatives with four mutations being completely non-fluorescent.” So a protein has to be “just right” to do its job – a few random changes here and there, and you break its functionality. Straightforward calculations suggest that you would need something like 1070 tries before random combinations would produce a particular protein. Natural selection would not help, because we are talking about proteins that need to appear before any cellular life appears, and before natural selection can begin. The miracle of a functional protein appearing would need to occur not just once but hundreds of times before even a primitive cell could appear. Then there's the unsolved problem of homochirality. Our cells use only left-handed amino acids and right-handed sugars. Were it not for that fact, it wouldn't be possible to make complex proteins. It would be like trying to finish a jigsaw puzzle when half of the pieces were turned upside-down; in that case there would be no way to fit the pieces together. But when amino acids are created in the laboratory, half are left-handed and half are right-handed; and so it is for sugars. You would have to have seemingly impossible lucky breaks needed for all amino acids to have the same left-handedness, with the sugars all being right-handed. Something like this seems rather like an additional winning 20-digit lottery ticket that needs to exactly match before life can get started. And I won't even go into the difficulties of explaining the origin of the genetic code, an ordered system of symbolic representations used by all living things. 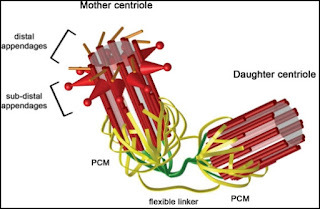 An example of machine-like functionality in our cells is the cell component called a centriole, which a biology text tells us is something that “looks more like something made in a machine shop than in a living cell” (Life Itself by Boyce Rensberger, page 59). 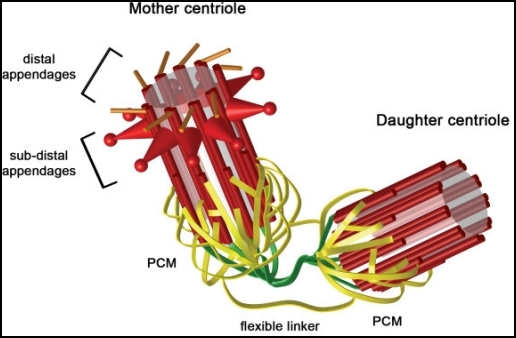 The same text says molecules of tubulin in a cell are “ like magic bricks that assemble themselves into a wall” (page 23). The same type of “magic brick” behavior is found in a vast number of complex proteins, which spontaneously assemble themselves into very intricate and complicated 3D shapes through a process called protein folding that scientists have been trying to figure out for decades, with very little success. Because explaining the appearance of a self-reproducing cell with hundreds of proteins is literally trillions of times harder than explaining the existence of simple particles or droplets splitting into two, I estimate that the Quanta article in question is guilty of a trillion-fold underestimation of the difficulty of cellular abiogenesis. But the article is in good company, because requirements underestimation is pretty much the central sin of the modern theoretical scientist (along with the sin of claiming to understand things that are not actually understood). Such folks often seem to be considering Everest-sized requirements for the existence of creatures such as us, and then trying to paint these requirements as if they were trifling. This involves trying to make high, high mountains look like molehills smaller than a basketball. A similar example of nonsense-speak is found in this recent news story which tells us that the “building blocks of life” have been found 200 light-years away. What were these“building blocks”? Merely carbon, nitrogen, and water. Calling such things “building blocks of life” is, of course, nonsense. Using a similar approach, you might print a big headline screaming “BUILDING BLOCKS OF CITIES FOUND ON MARS,” and then mention that these “building blocks” were merely unorganized deposits of carbon, nitrogen, and water. The building blocks of cities are houses, and the building blocks of life are things like proteins, cells, and nucleic acids such as DNA. No such things have been found in distant space. 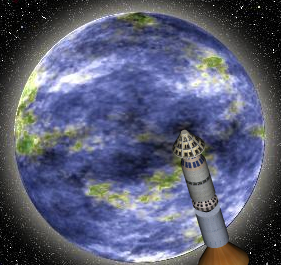 Is Our Universe More Improbable Than a “Boltzmann Modern Earth” ? Cosmologists sometimes discuss a possibility called a Boltzmann brain. A Boltzmann brain is the hypothetical possibility of a brain forming somewhere in space from an incredibly unlikely random combination of particles. Some have tried to explain the very unlikely existence of our universe by using reasoning along these lines: don't be surprised to be an observer in a universe like ours, because observers can only exist in universes like ours. But the possibility of a Boltzmann brain is sometimes presented to rebut such reasoning. Let's consider two possibilities. In the first case, you live in a universe that is 99.9999% disorderly and chaotic, but there is just a tiny little area of space that is highly orderly, just orderly enough for your brain to exist. In the second case, you live in a universe that is orderly for vast regions stretching billions of light-years, with enough order to allow the possibility of trillions of life-bearing planets. Our reality is the second of these cases. 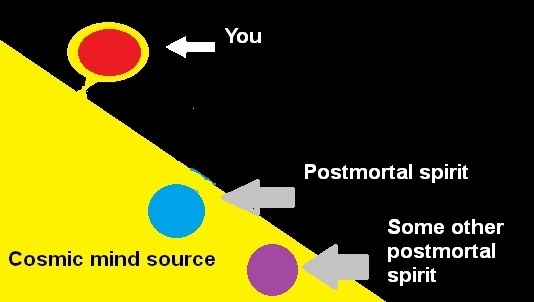 But some cosmologists have argued that from a thermodynamic standpoint and an entropy standpoint, a "blind chance" standpoint, it is inconceivably more probable that you should find yourself as an observer under the first of these two cases. Another possibility to consider (rather similar to a Boltzmann brain) is what we may call a “Boltzmann modern Earth.” This is the incredibly unlikely possibility that a planet the size of Earth, with all of the complexity and biology of our planet, could arise fairly suddenly from a random combination of particles. This possibility of a "Boltzmann modern Earth" is discussed by ace cosmologist Roger Penrose in his recent scientific book Fashion Faith and Fantasy in the New Physics of the Universe. On page 316 of his book, he says, “One can make a very rough estimate of the probability that life, as it now exists on Earth, with all its detailed molecular and atomic locations and motions, came about simply by chance encounters from particles coming in from space in, let us say, six days!” Penrose then estimates that such a thing would have a probability of about 1 in 10 to the ten to the sixtieth power. That is a probability not anything like the microscopic probability of 1 in 1060 but instead an almost infinitely smaller probability. It's the probability you would have if you started out with one tenth and then kept multiplying by one tenth a total number of times equal to a trillion trillion trillion trillion trillion times. But then Penrose tells us that this fantastically unlikely event (a life-filled Earth like ours suddenly forming from random collisions of particles) would be far more probable than the existence of a universe as orderly as ours, saying it “would be a far 'cheaper' way of producing intelligent beings than the way in which it was actually done!” He's indicating that the incredibly improbable sudden formation of a “Boltzmann modern Earth” would actually be much more likely than the chance of you getting a universe such as ours accidentally. The lower-entropy earlier states of the universe that initially gave rise to humanity in its earliest stages (being of lower entropy simply by virtue of the 2nd law) must have been far more improbable (in this sense) than is the situation now. This is just the 2nd law in action. So it must be “cheaper” (in terms of improbabilities) for the state to have come about as it is now purely by chance, than for it to have arisen from an earlier much lower entropy state – if that had come about purely by chance! And on page 313 Penrose states that “the improbability of the universe conditions that we actually seem to find ourselves in” is roughly 1 in 10 to the 10 to the 124th power, which is a probability almost infinitely smaller than the 1 in 10 to the 10 to the 60th power estimate he made for the chance of a planet with all of Earth's biology appearing suddenly from random particle collisions (a “Boltzmann modern Earth” occurring). 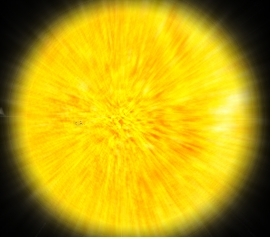 This 1 in 10 to the 10 to the 124th power probability is the probability you would have if you started out with one tenth and then kept multiplying by one tenth a total number of times equal to ten thousand trillion trillion trillion trillion trillion trillion trillion trillion trillion trillion times. Why such a low probability? The Second Law of Thermodynamics dictates that entropy must steadily increase. But right now the entropy of the universe is fairly low. 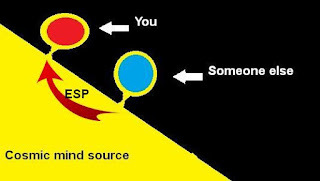 Situations such as solar systems surrounded by vast amounts of empty space are very low entropy situations (as opposed to a universe that is a uniform sea of particles, which is high in entropy). It seems that if the universe has the low entropy it now has after 14 billion years of existence, the entropy of the universe must have been staggeringly low at the time of the Big Bang. And from a thermodynamic standpoint, such a thing seems insanely unlikely. Penrose is one of the most well-known cosmologists around. If his statements on this topic are correct, then we have perhaps a tremendous irony. 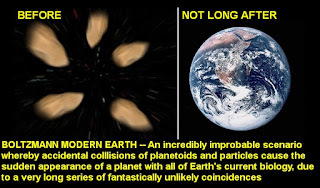 Centuries ago, people argued that our planet and its life could only have appeared if there were some higher power in the universe, on the grounds that it was too improbable that so much order could arise by chance. Now after all our advanced science, much of it done by people wishing to overturn such a conclusion, we may have discovered that the chance of this type of order existing randomly by chance (considering the history of the universe, the Big Bang, entropy and the Second Law of Thermodynamics) is not greater than was imagined long ago, but actually very much smaller. In an ideal world, you would only read news accounts that accurately described scientific research, without giving you exaggerations or misinterpretations. But we don't live in such a world. In our world there are three vested interests that may cause the raw data of a scientific experiment to be distorted, twisted or exaggerated. Many people think that a scientific researcher is some entirely impartial person who will write a scientific paper describing data with dry objectivity. Many researchers act in such a way, but many others do not. Consider the following all-too-common type of case. Imagine you are a scientist who has put forth a research proposal asking for funding from some institution such as a university or the federal government. You do the experiments, but nothing very interesting comes up. How do you then describe these results in your scientific paper? You have a problem if you honestly describe the research as a failure to find anything interesting. For one thing, such honesty may decrease your chance of being funded the next time you present a research proposal asking for funding from the same institution. Also, honestly reporting the research as a failure to find anything very interesting may mean that your scientific paper will not get published. That's a problem given the “publish or perish” culture inside universities, in which it's almost as if each researcher is expected to produce a certain number of published papers each year. When you read a news story on some scientific finding, you are typically reading an account that is based on a press release issued by a college or university, typically a press release issued at the same time the scientific paper is published. Some web sites simply publish such university or college press releases word-for-word; others have stories that are based on such press releases. What often happens is that the college or university press release will exaggerate or over-dramatize the scientific research it describes. Why would such a thing occur? It occurs because the college or university has a motive to present itself as a place where important research is occurring. If a university issues a press release entitled, “We Funded This Research, But It Didn't Find Anything,” then such a story is not one that can be used on the university's web site to help attract student enrollments and donors. But if the same research is described with a press release entitled, “Fascinating New Research Probes the Frontiers of Knowledge,” or something along those lines, then such a press release has some value in helping to uphold or build the university's reputation or prestige. So clearly a university or college can have a vested interest in hyping or exaggerating somewhat the announcement of scientific research it has funded. 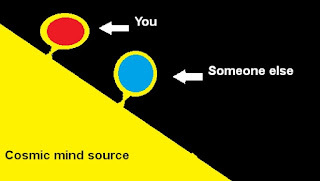 The biggest inflation in the chain of exaggeration can occur when some popular web site writes a story based on the press release issued at the same time as the scientific paper. Here shameless hyping and unbridled exaggeration are very common, and simple lying is not very uncommon. Some research suggesting a possibility only very weakly may be trumpeted as dramatic proof of such a possibility, or the research may be described with some claim completely at odds with what the research actually found. It's pretty much an “anything goes” type of situation. Why does this happen? It all boils down to money. The way large modern web sites work financially is that the more people access a particular page, the more money the web site gets from its online ads. So large web sites have a financial motive to produce “click bait” stories. Here's an imaginary example. A scientific study asking lots of health questions of respondents may “data dredge” its way to reach a very modest, borderline correlation between Alzheimer's disease and, say, brushing with toothbrushes older than two months. Let's say it finds that you are 2% more likely to get Alzheimer's if you brush with old toothbrushes. This borderline result (probably due to just coincidence) may be hyped up a bit by some university press release with a headline such as “An Intriguing Link Between Alzheimer's and Toothbrushes?” But then when you go to your favorite news site, you may see a "runaway hype" link such as “PROOF YOUR TOOTHBRUSH IS MELTING YOUR BRAIN.” That link is click bait. When you follow the link, you may either find a story honestly mentioning how borderline the results were, or you may find a story exaggerating the results and terrifying you. For the web site, it really doesn't matter. The people running the site were merely interested in getting you to click on the link, so that they could make money from the display of the online ads. And at each of these $$$$ points we should hear the ka-ching of the cash register, the sound of a vested interest profiting directly or indirectly. For some tips on how to spot overblown hype in a science-related news story, see this post.